OAKLAND, Calif. (CNS) — A new shiny truck is bringing food to senior citizens in Oakland’s Fruitvale neighborhood and nearby communities. A year in the making, the Mercy Brown Bag Program has expanded, with the truck visiting several locales and offering assistance to seniors faced with the high cost of rent and medication. Krista Lucchesi, director of the program that is part of the services of the Mercy Retirement and Care Center, couldn’t stop smiling as she looked at the vehicle parked behind the residential care facility. Having the truck “now is kind of amazing for all of us,” she told The Catholic Voice, newspaper of the Oakland Diocese. Staff and volunteers cheered the truck as it arrived April 2 after a cross-country trip from St. Louis, where it was built. 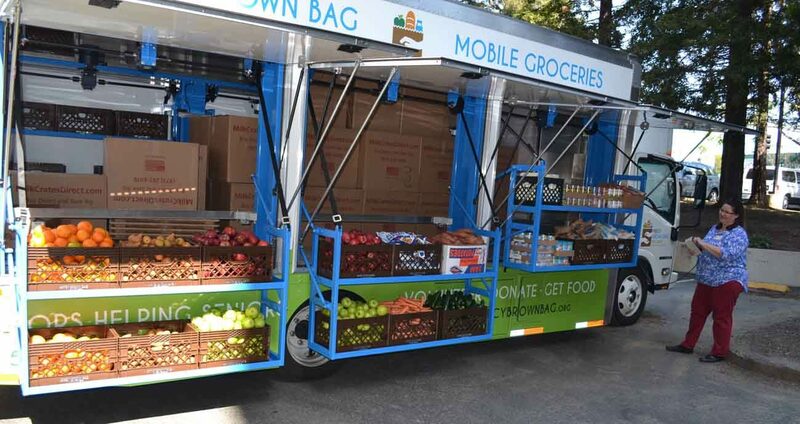 Nicole St. Lawrence, Mercy Brown Bag’s assistant director, brought the truck west on a mission to help stem the tide of senior hunger in Alameda County. Most recipients enrolled in the Mercy Brown Bag Program have an average yearly income of less than $12,000 in a county where the annual median income is $82,000. Average rent for a one-bedroom apartment is about $1,663 a month, Lucchesi said. In such a costly environment, many seniors must make difficult choices about buying food, medication or shelter in order to survive. “Healthy food is usually the first thing they will give up,” Lucchesi said. That’s where the Mercy Brown Bag Program comes in. The program delivers food to 5,000 seniors at 17 sites and through 45 social service providers. Most of the food that the program distributes comes from the Alameda County Community Food Bank. Each registered person can take home up to 20 pounds of groceries. Much of the food from a variety of food groups can be considered senior-appropriate: low in sodium and easy to chew. Contacts at the distribution sites indicate which foods are more desired or more popular. Fresh produce makes up the majority of the food delivered. The new truck is equipped with a system that will lower baskets of produce to street level, making food selection easier. The truck has a refrigerated area, allowing for the transport of milk and other products that must be chilled. The food truck, which cost about $200,000, was paid for with donations from the Thomas J. Long Foundation and the Carl Gellert and Celia Berta Gellert Foundation. The truck is allowing the program to reach up to 3,000 more seniors in need, Lucchesi said. “We are currently building our route to see which areas are not as well served,” she said. The truck also will help address new challenges facing seniors. The truck may also help address public transportation concerns. “We have been getting calls where people are saying, ‘I don’t have any money to get on public transportation to get to one of your sites.’ They are really, really living on the edge. This (truck) is a way to get food to them so that they don’t have to go on public transportation,” Lucchesi said. A formal dedication of the truck took place April 19 and deliveries were to begin as soon as drivers were hired and trained. McClish is a staff writer for The Catholic Voice, newspaper of the Diocese of Oakland.